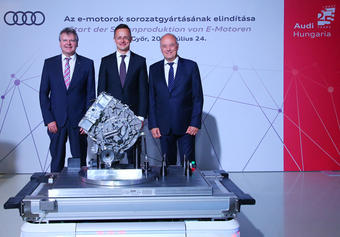 Győr, 24 July 2018—The beginning of a new era at Audi Hungaria: The serial production of electric engines was officially launched in Győr today. At the symbolic production launching ceremony, Péter Szijjártó, Minister of Foreign Affairs and Trade, Peter Kössler, Member of the Board of Management for Production and Logistics of AUDI AG and Achim Heinfling, Chairman of the Board of Management of AUDI HUNGARIA Zrt commissioned the production equipment together. The electric engines are made in an assembly hall of 8,500 square metres using a new concept, the modular production method. The company has implemented an investment of two-digit million EUR to realize e-engine manufacturing. Currently, there are about 100 employees working in the new area. “Audi Hungaria has been playing a decisive role in the history of the four-ring company for 25 years. Our Hungarian subsidiary is entering a whole new area of competence by manufacturing electric engines. With this unique know-how, Győr will be the central production site for electric engines and embody our strategic transformation process that will make us a sustainable provider of mobility services”, Peter Kössler, Member of the Board of Management for Production and Logistics of AUDI AG said at the symbolic production launching ceremony. “Audi Hungaria takes a leading role in e-engine production. I am proud of the expertise and motivation of our colleagues. 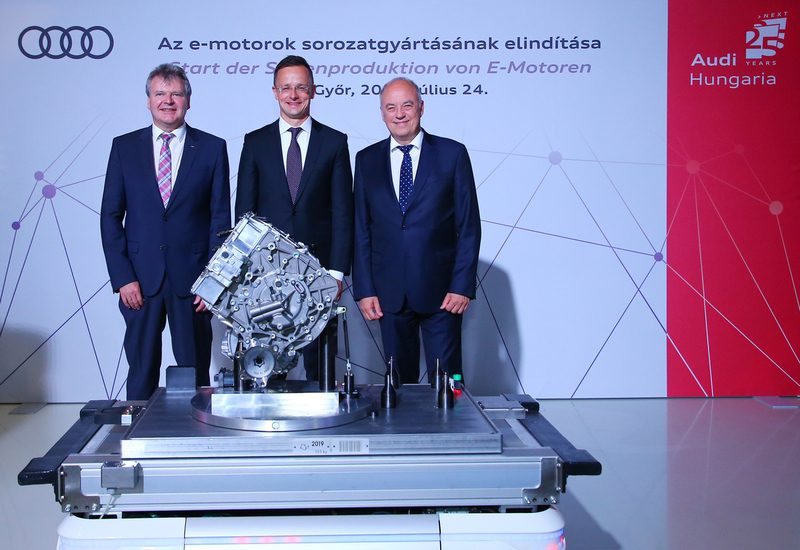 They were committed to successfully implement the phase-in of our new electric engines”, Achim Heinfling, Chairman of the Board of Management of AUDI HUNGARIA Zrt said. The first electric drive systems of Audi Hungaria will be made for the Audi e-tron. This is the first 100% electric Audi model, which will be manufactured at Audi’s Brussels production site. were installed within a year. The necessary facilities were built in close cooperation of the departments of E-engine Development, Production Planning and the Experimental Motor Manufacturing Centre in Győr. With the present daily capacity, about 400 electric engines can be made each day, which can be gradually increased. Currently, there are about 100 employees working in the new area, and this number will grow above 130 by the end of the year. Production is performed in a one-shift work schedule, but it will soon be changed to three shifts a day. The electric engines from Győr offer many new features. In the case of the stator (which is the main part of the e-engine) the goal is to reel as much of the thin copper wire around the blank as possible. The tighter the reeling, the more efficient the power transmission. At Audi Hungaria, newly developed retracting and reeling machinery can compactly reel the optimal amount of copper wire, and then build it into the blank. Further main components of the electric engine include the power electronics, which will be built into a separate housing, the drive gear and the two axle shafts which transmit power to the wheels. Two different types of drives are manufactured for Audi e-tron at Audi Hungaria because, as per the Quattro tradition, both the front and the rear axles are driven. Production equipment, robots and screwing and gauging stations are fixed but not connected by a linear belt. Instead, the engines are made in a modular system, on so-called production “islands”. Although the order of assembly is predefined, the modular design allows the paths between the job stages to branch, which allows more elbow-room in the production process. Workpieces are transported to the workstations by driverless transport systems, controlled by an intelligent IT system. In parallel with the production equipment, Audi Hungaria commissioned three e-engine testing benches in the area of technical development to test permanent load. In the e-Competence Centre, Audi employees became technical experts of e-engine production. Audi Hungaria has manufactured 1,965,165 engines last year, which makes it one of the world’s largest engine factories. In 2017, six different gasoline engines and three different diesel engine variants were manufactured at the Győr site in the performance ranges of 63 kW (86 HP) and 470 kW (639 HP). About 6,000 employees prepared more than 9,000 engines a day for the 32 vehicle production sites of the Volkswagen Concern.